Many Soviet-era hotels in Moscow and other cities have undergone large-scale reconstruction in recent years and are now in the hands of international operators. Hulking, bleakly grey and occasionally claustrophobia-inducing, Soviet-era hotels are ready to be spruced up — if investors will have them. Many Soviet-era hotels in Moscow and other cities have undergone large-scale reconstruction in recent years and are now in the hands of international operators. The advantages of undertaking such reconstruction work versus demolition and starting from scratch, however, are debatable. "If you got [the Soviet hotels] through privatization or bought them cheaply, then perhaps they can be reconstructed and the cost won't be much," said Sergei Kalinin, president of Hals Development. "But generally, with the exception of architectural gems, it makes more sense to start new construction." Hals Development plans to allocate more than $100 million to refurbish the Pekin Hotel near Mayakovskaya metro station, which first opened in 1956. The hotel is slated to close in December 2013 and re-open in 2017. Among other notable reconstruction efforts are the transformations of the Hotel Minsk into the InterContinental Moscow Tverskaya, the Bucharest into the Baltschug Kempinski, the Leningradskaya into the Hilton Moscow Leningradskaya and the Mezhdunarodnaya into the World Trade Center Hotel. The main advantage of redevelopment over new construction is a much faster time to market, said David Jenkins, head of hotels and hospitality group at Jones Lang LaSalle. An average timeframe for new construction is 15 to 20 months, whereas renovation could take as little as nine months, according to statistics from the St. Petersburg-based construction company STEP. The old hotels can even continue operating on some floors while other parts are undergoing renovations, said Rustam Dominov, managing partner of STEP. Dominov added that reconstruction allows investors to seize prime spots in the city for their projects. "Reconstruction delivers a good product that is situated in an advantageous location, and a site that has a rich history," he said. "If you're lucky enough to own such a [Soviet] hotel, you need to use the opportunity." Not all Soviet-built facilities have central locations though. As Jenkins said, most of the centrally located properties in Moscow have already been snatched up, either for reconstruction projects or brand new developments. For example, Hotel Inturist was knocked down to make way for Ritz Carleton and Four Seasons will open later in the year where Hotel Moskva used to stand. 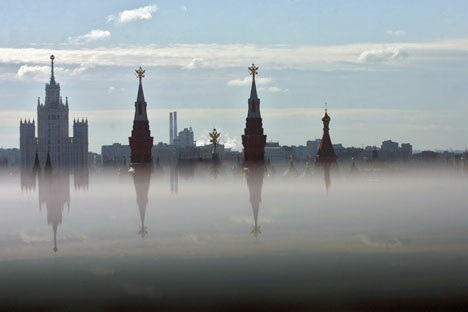 Moscow now has about 40,000 hotel rooms of which 15,000 to 16,000 are quality rooms managed by experienced operators. The remainder are of worse quality, potentially suitable for reconstruction, but rarely in central locations. "There's nothing on Tverskaya, Red Square or Belorussky station today, and that's what we mean by central," Jenkins said, adding that outside the city center it is more profitable to build from scratch. New hotel construction costs 60,000 rubles ($1,900) per square meter while reconstruction costs 40,000 rubles per square meter, according to STEP. The price differential comes from the fact that investors rarely try to alter the carcass of the building so Soviet-period hotels undergo only minimal improvements, Dominov said. But while keeping costs down, not changing the existing infrastructure of Soviet hotels can also be a roadblock to a grander vision. Many of these hotels have small rooms — 18 to 22 square meters on average — and low ceilings. They are also lacking modern technological systems, such as air conditioners and fire alarms, which can be hard to incorporate into an existing structure. As a result, the maximum number of stars these reconstructed hotels usually get is three or four. If investors had opted to not demolish the Hotel Inturist but use its carcass as the basis for a new hotel, the final product would have received a maximum of four stars, Jenkins said. Additional challenges come from having to rebrand reconstructed hotels to escape their Soviet reputation. In 2010, then-Moscow Mayor Yury Luzhkov made a public announcement at the opening ceremony of the reconstructed Ukraine hotel that the Stalin era venue should keep its old name instead of being renamed to Radisson Royal Hotel Moscow. He explained that it would cost a lot to change the name on city maps and referred to the example of Radisson opting to rename another reconstructed hotel, Slavyanskaya, into Radisson Slavyanskaya rather than drastically changing its name. Despite the challenges, the trend for reconstructing Soviet hotels is picking up in large cities, particularly those slated to host the World Cup in 2018, and the resorts of the Stavropol region, Dominov said. Sochi also has redevelopment projects in the city center, though some investors prefer to wait. "There is not a lot of interest in Sochi," Dominov said. "Most investors are putting projects off until after the end of the Olympic Games."